In February 2018, a study was performed to look at the emotional risks of a Nurse. The results were shocking. Nurse Bullying is a real and present danger, and it affects every Nurse. In a 2018 study of over 2,000 nurses, 43% were considered high risk, with 7% reporting actions of self harm or thoughts about it. 11% reported previous suicide attempts. All of the participants of the study showed some sign of risk. Nurse Suicide is not uncommon, and the majority of the time is stemmed from bullying in the workplace. 1. Forty-five percent of nurses have been verbally harassed or bullied by other nurses, according to a 2017 survey by employment agency RNnetwork. Forty-one percent of those surveyed said they have been verbally harassed or bullied by managers or administrators. Some nurses (38 percent) even reported having been verbally harassed or bullied by physicians. More than half of the nurses who reported work harassment indicated they were considering leaving the profession all together. 2. While some forms of bullying nurses experience are overt, like verbal harassment, threats or physical violence, other forms are more subtle. Researchers refer to this subtle harassment as “incivility,” a form of bullying commonly brought upon young nurses by their more experienced counterparts. Renee Thompson, DNP, RN, said incivility can take on many forms, including sabotage, withholding information, excluding others, unfair assignments or downplaying accomplishments. 3. For some nurses, incivility can wreak havoc not only on their self-esteem, but on the health and well-being of their patients. In an interview for Marie Claire, 27-year-old Christi — who declined to provide her last name to the publication — said about four months into her job as an intensive care unit nurse at a North Carolina hospital, a group of nurses refused to help her care for a patient who had suddenly lost consciousness. A week after stabilizing the patient on her own, a friend told Christi not to go into her locker and to call a manager. Christi said she opened her locker and, after lifting her clothes with a tongue depressor, discovered a bloody syringe. “My first thought was, ‘This could be attempted murder’ … because I didn’t know what was on the needle that I would have contracted if it stuck me,” she told the publication. 4. Nurses who have historically faced bullying or harassment in the workplace often do not report their concerns. If they do report the bullying, managers may do little to remedy the situation. During a September 2016 discussion hosted by the Association of periOperative Registered Nurses and streamed live on Facebook, Linda Groah, MSN, RN, CEO of AORN, cited a survey in which only 38 percent of managers said they attempted to address complaints of bullying brought to their attention. Christi told Marie Claire she asked management to investigate the situation involving her locker. She said management refused, stating they “[couldn’t] fire 14 people for one nurse,” according to the report. Christi said she decided to leave the health facility after management did not allow her to change shifts or transfer departments, according to the report. The two marry together. In August, Rhian Collins who worked at Cefn Coeh Hospital in Swansea, UK hanged herself in her home. An inquest heard, She told her family her colleagues made her life ‘very difficult’ and would given her the worst night shifts. On September 5th, Scrubs Magazine spoke to a victim of bullying. Andi Vordermann (soon to be a Student Nurse) ‘endured Hell’, felt sick to her stomach and spent many a sleepless night due to the strains brought upon her from bullying. Andi talked to us about the situation. Andi never claimed to be a Nurse and never misrepresented herself. She simply reserved the Instagram handle and used it to post documenting her way to becoming a student nurse. That’s when a user by the name of Twitter.com/Techy_Nursey started her attack. Andi’s instagram page then came under attack. @BeerandScrubs an LPN Nurse also joined in on the bullying. Her post which is still visible on Twitter at time of publishing, she also posts pictures of herself allegedly hungover at work. 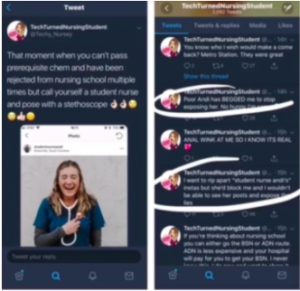 Andi detailed in a post the next day clarifying her situation, that she wasn’t a student nurse yet and she wasn’t trying to dupe anyone. Messages of love poured through. However, the bully was still on the attack. 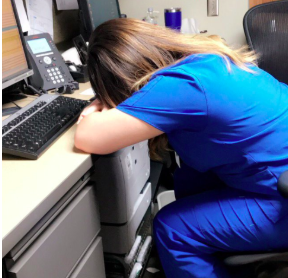 The next morning Andi woke to dozens of messages from other Nurses where Techy_nurse had still been posting about the situation. Andi had mentioned it to Nurse_Leah who had had enough of the bullying behavior, after displaying her anger about the situation, the attacks got worse. Nurse_Leah inspired Andi to post on her social networks and out the bully. ‘If this situation helped anyone else speak out then it’s worth it, it was only recently that another Nurse committed suicide because of bullying’. It doesn’t take someone special to get bullied, it can happen to anyone. Amongst the abuse were many other lies that the bully inflicted on Andi, such as failing a class and not getting accepted into the nursing program. Ironically enough, the picture @techy_nurse used to bully Andi was from her promoting a mental health campaign. An astonishing sixty percent of new nurses quit their first job within the first six months due to the behavior of their co-workers, and nearly 50 percent of nurses believe that they will experience bullying at some time in their careers, according to research presented in an e-book from Aurora, Colo.-based American Sentinel University, by Dr. Renee Thompson. Nursing is a female dominated profession. “Theories suggest that age-old female ‘competition’ has shifted from competing over a man to competing over status, respect and position in the nursing environment. The same behaviors once witnessed between two women fighting over a man are the ones witnessed today in the behavior of bullies,” Dr. Thompson wrote. In a 2017 study, participants that were involved in a ‘positive thinking’ test were delivered daily doses of positive affirmations, motivations and audio. Nurses had to complete various quick tasks associated with positivity. The results of the study confirmed that interventions using social media tools were associated with improved knowledge, attitudes, and skills. This revealed the work life quality of the nurses increased after receiving the training. Therefore, one can conclude that teaching positive thinking has a positive impact on work life of nurses. Our goal is to spread that positivity, and remember why you got into Nursing in the first place. 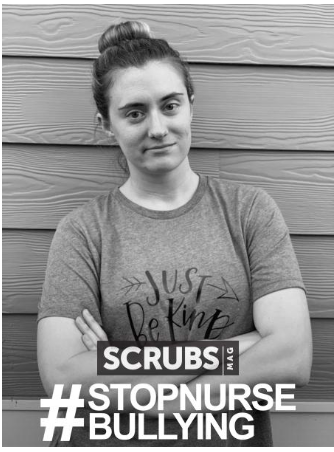 Scrubs Magazine has launched #StopNurseBullying, a campaign to help Nurses report those that are bullies in the workplace. In an industry that is massively short-staffed, we cannot afford to have 60% of Nurses quitting in their first 6 months, nor will we tolerate 50% of you being bullied. If you are or know anyone who is being bullied, you can now report them anonymously online at here today. We will forward the information to the hospital in question along with any information you can provide. Get your special #StopNurseBullying filter now by going to our bullying page or clicking the image below.